Samtec MEC5 Extreme Density Micro Edge Card Sockets, available from Mouser, are 0.5mm pitch edge card sockets with a justification beam. This design enables high-speed signals to pass through an astonishingly dense connector while maintaining the mating PCB at a fair cost. 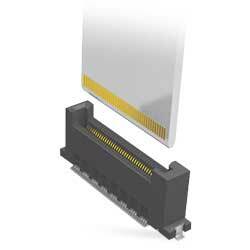 The justification beam of the socket is intended to shift the card into correct alignment with the contacts providing for a standard board tolerance on cards that normally would not work with ultra-fine pitch connectors. Manufacturing costs are then optimised creating a 30-50% PCB cost savings and a high yield for standard cards. The extreme density of the ultra-fine 0.5mm pitch edge card sockets offers amazing space savings in comparison to the more common 0.8mm pitch solutions. The device is offered in both vertical (MEC5-DV) and right-angle (MEC5-RA) options featuring up to 300 total I/Os for high-density applications. To satisfy the industry’s demands for speed, the vertical socket is created for 28Gbps NRZ/56Gbps PAM4 performance. Both orientations are designed to handle PCIe Gen 4 signalling. Rated to 1.5A per contact, this system allows 0.062” (1.6mm) thick cards and offers standard alignment pins and card polarisation. Choice of through-hole or surface mount rugged weld tabs are offered for a secure connection to the board.